Is The Appeal Of The Ultrasport F-Bike Home Trainer All In The Frame? 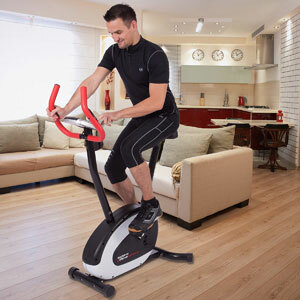 Folding exercise bikes are must have items for many apartment owners with minimal time – and the Ultrasport F-Bike 200B Home Trainer is a stand-out option. This bike folds more neatly than the competition with its great shape and clever design. There isn’t much else in the specification, so can this bike still provide the workout that users are after? 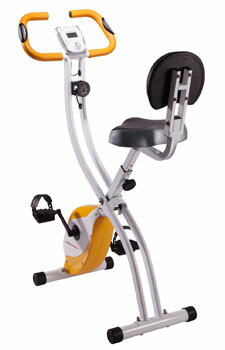 Does The Ultrasport Racer 150 Exercise Bike Provide A Good Entry-Level Workout? Sometimes, all we really want from an exercise bike is something of good value with just enough to get started, which is where the Ultrasport Racer 150 Exercise Bike comes to the rescue. This fitness bike has the right look for an at-home gym, with a decent casing for the 4kg flywheel, an adjustable seat, strong frame and those bright orange handlebars. The specification talks about the potential for “balanced training for strengthening your cardiovascular system, fitness and muscles. It all sounds great, and looks good, but how does it actually perform? Does The Dual Function Of The Ultrasport Home Trainer F-Bike Pay Off? The Ultrasport Home Trainer F-Bike is one of those simple exercise bikes aimed at general fitness that has an extra feature to draw in buyers. This folding bike has the standard shape, basic features and a simple LCD display, but one of the sales pitches here is the invitation to “keep yourself busy while you exercise” thanks to the addition of the workstation on top of the bike. This suggests that this bike is doubly functional, but is this the case? Is The Folding Frame Of The Ultrasport Exercise Bike F-Bike Too Much Of A Star Feature? The inclusion of 8 resistance levels, pulse grips and a console for speed and calorie data is pretty standard these days but there are other aspects to the Ultrasport F-Bike Exercise Bike that make it stand out. 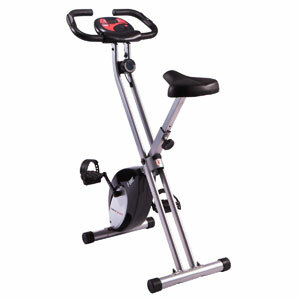 The F-Bike is certainly one of the more unusual looking exercise bikes around with the odd shape to its frame and the black and orange detailing and this shape is largely due to the foldable design that is its key selling point. Is this star feature enough to ensure that buyers are recommending this bike to other consumers? 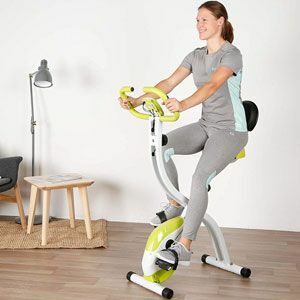 A Quick Overview of the Ultrasport Home Trainer F-Bike – If you want the freedom to exercise from the comfort of your own home, so that even on a rainy day you can still go for that brisk bike ride – but have limited space then you should consider the benefits of this fitness bike. 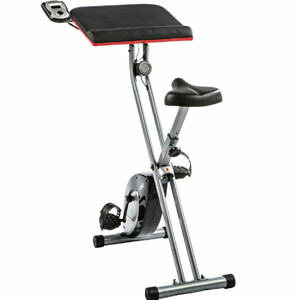 This is a foldable exercise bike that is lightweight and as easy to set up as it is to collapse and fold away when you are finished with it.